Photography with a lasting impression. been seized by the army incarcerated and tortured. was released on the appeal of a bishop). Brownstone asked to see his wounds as verification. go to Costa Rica for medical care and personal recovery-since living in Honduras in hiding and constant fear was not a viable option.Colomancagua, Honduras, ca. 1985. Women from Ayacucho, Peru. Photography by Stephanie Colvey. Exhibited as part of the Rights and Realities exhibition created in collaboration between CIDA and the CMCP. This is a photograph of internally displaced families in Peru. 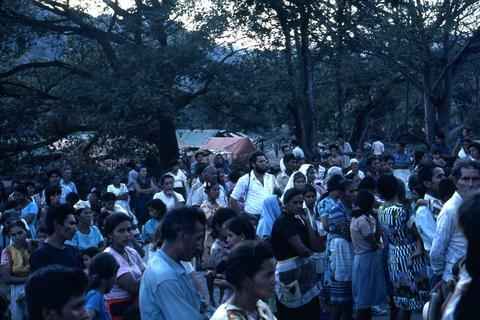 The government at the time staged this press opportunity to demonstrate its benevolence towards the indigenous minority. The government promised food aid, and had families--mainly women and children--wait for hours in the sun behind barbed wire--for trucks with food to arrive. In 1994, Colvey returned to Peru after having worked there extensively in the 1970s and reconnected with a woman she had become close to on her earlier visits. On that trip she learned that the Peruvian health professional had, in the interim, named her daughter Stephanie in honour of the friendship they had developed.